I'm looking for slip-on Exhaust for my fz10, not planning flashing the ECU in near future. I love the look of Akra, but its too expensive for me(1000 CAD). I always wanted graves, I just can't find any real reviews, videos or pictures online. I can get graves for ~500 CAD here (im in NS, Canada). If anyone have it, please share your comments about it, picture and video would be awesome as well. It is kinda sad that graves don't have full titanium slipon option for FZ10. I Guess hindle would be another option, but not interested in 3/4 systems at the moment, only cat back slip-on. I'm shopping for an MT-10 as we speak, so should get one at any time. I didn't even know of this exhaust, but saw it on a bike for sale, and thought it was the best looking of them all. Plus no freaking springs or bands. To be honest, you can't go wrong with any slip-on IMO. Even the stock one is straigh-thru, so it won't be loud. The stock one looks cheap, so I'm doing this mostly for cosmetic reasons. But I'd like to hear one too. Looked everywhere, and no sound clips. Asked the guy with the bike for sale, but so far hasn't even replied. Hopefully one of us can find a sound clip . I'm going to call them right now and ask if their logo can be removed, for a stock look. If yes, I'm sold on that one. My other choice was the black Remus, but I'm almost sure it has a strap. Need to recheck on that. Also on price, since they're typically the most expensive, along with Akras. Hey, they also have stock-looking frame sliders; will get those too . Thanks! keep me posted pls. I know from research - Graves is high quality and best for Yamaha. Their short titanium on R1 looks awesome! I just can't find any videos or reviews on slip-on. Im planning to keep cat for now, so no full exhaust options. For frame sliders I went with woodcraft, they are solid, i had on my XSR as well, prefer that look(went with red color on my black fz10, will see how it looks, along with some other red rizoma parts). For slip on videos you can also look at the '15+ R1 sound clips (there should be more of them floating around) to get an idea. Are you talking about the Moto 1 slip on from Graves? The problem with sound clips is they very poorly capture sound and tone. They are better than nothing, but not by much. I don't think I can go wrong with Graves, specially for Yamaha. My only concern is - can I change midpipe later? will it work with graves cat back slip-on exhaust ? I don't think the slip-on will fit the cat delete pipe: the slip-on has a short, almost straight connector pipe and the cat delete pipe requires a longer, curved section. See if I get that slip-on, I can'r use it wit graves mid Pipe(Which replaces stock catalytic converter as I understand)? 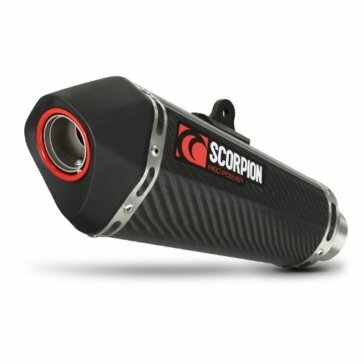 I just ordered a Scorpion Carbon fiber Sekrat to replace the stock can. Kimpex is the distributor in Canada. I will eventually get the cat delete mid pipe, but it has to be special ordered from my dealer. Probably wait for my warranty to expire since the cat delete will most likely mean an ECU flash. Let us know how it fits and sounds. I'd get the Graves EVR system. It's pricing but it really kicks the pants off anything else I've tried. The Graves EVR can be made as short as 200mm, you just have to ask them to make it this way before placing your order.